As part of the large ski center at Kaimaktsalan, which offers restaurants, fast food, lifts, instruction and equipment rental shop, there are offered seven mini suites complete with private facilities and elegantly designed rooms. This is a perfect choice for skiers who wish to stay right on the slopes during their entire ski holiday. The suites are outfitted for two persons, with large double bed, heating and private bath. Other amenities include plasma screen television with Dolby surround-sound, Internet connection, mini bar, safe box, and access to Jacuzzi and sauna. 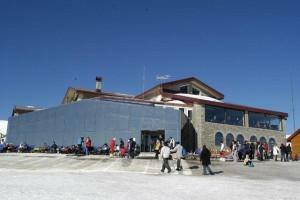 The ski center is situated on the peak of Voras Mountain in Edessa at 2040 meters.